One hot educational issue is whether online degrees are better than traditional degrees, but today many people are looking at voluntary accreditation for colleges. The debate has turned from whether an online school is as good as a brick-and-mortar college to a question of whether or not accreditation matters. If it is important, why is it voluntary? Accreditation is a system of quality assurance for school systems. The process is a century old, and—in America, at least—is a voluntary credentialing. In many other countries, the organization that charters schools, monitors them and sanctions poor performance is the government. The process is paid for by taxes. In the US, accreditation organizations are largely manned by volunteers and paid for by professional fees. In fact, that is what accreditation amounts to: validation by one’s peers. “Advance-ed.org” defines accreditation as processes derived from educational research that examines the “programs, cultural context and community of stakeholders to determine how well the parts work together to meet the needs of students.” In the case of college accreditation, schools have agreed upon a set of standards that educational institutions should adhere to and private third-party organizations proctor the accrediting process. What Does the School Receive as a Result of Voluntary College Accreditation? 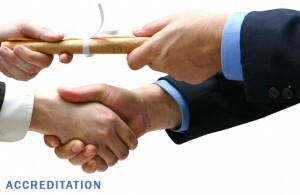 What advantages are there to being accredited? For one thing it helps the schools assess their success or failure in meeting their own goals. More important, perhaps, is the fact that education is big business in America. The website “Your Accreditation Mentor” says schools compete for students, governmental monies and top-notch faculty. Students look to accredited colleges since many scholarships and grants can only be used at accredited schools because the education at those institutions is deemed a better investment. Besides that, employers prefer, and sometimes demand, job applicants to come from accredited colleges and universities. If accreditation is so important, why is it left to the schools to decide if they want to be credentialed? It is partly because many schools will look at accreditation as a huge test, or rite of passage, they must pass and spend much time and effort “cramming” to meet the standards. Another factor is that, because the accrediting organization is voluntary, they have no right to close down non-compliant schools. That is, the sanctions are largely positive. If a school chooses to apply for accreditation and achieves the credentials, it is rewarded by the increased academic reputation it gains. If it loses accreditation, it must deal with the associated loss in prestige, and the loss of students and revenue but it will not be shut down. Plus, if schools had to be accredited, there would be no value in the recognition. Students who want the assurance of a quality education choose accredited schools. They know that the school elected to meet and maintain the standards of the credentialing organization and was not forced into compliance. Other countries may stipulate that schools all must meet a minimum standard, but in American colleges excel by choice. That is the biggest reason for voluntary college accreditation.